Justin Gaethje: Are You Not Entertained? “Five more fights.” Those were the words of former WSOF lightweight champion Justin Gaethje, moments after being stopped for the second time in his career. He only has five more fights left in him. “I don’t fight to win or lose. I fight to entertain.” He certainly does just that, but this sentiment is somewhat betrayed by the glimmer of disappointment lurking in his eyes. 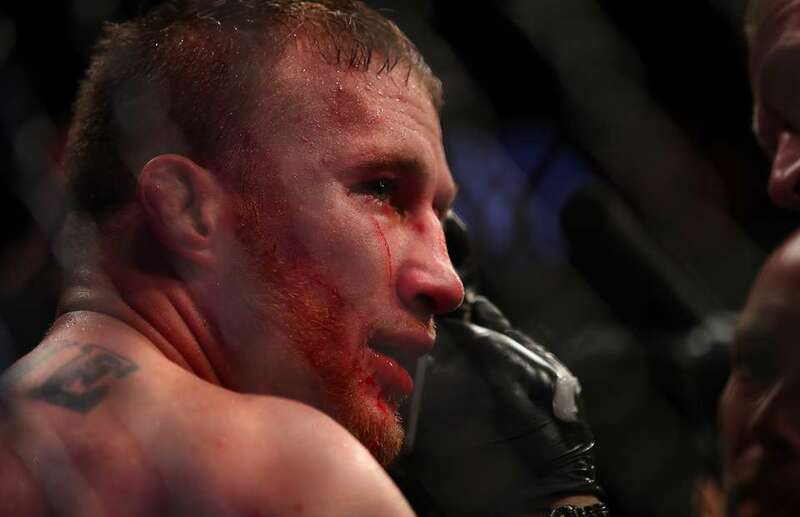 His bout with Dustin Poirier was a spectacular display of violence, but is this really enough for Gaethje? Justin Gaethje entered the UFC with a perfect 17-0 record and a reputation for wildly entertaining brawls. His style centres around a high pace and gritty resilience, taking several to give one. A granite chin and frenetic work rate has produced nothing but instant classics throughout his career, and this hasn’t changed since his UFC debut. Nearly a year later, he finds himself 1-2 on the biggest stage, but three for three in fight of the year contenders. If Gaethje is to be believed, everything is going just fine. Questions about his game have nipped at his heels since his early days. The former Division 1 wrestler rarely uses those skills in his fights, electing instead to brawl, hoping to outlast his opposition. It worked for eighteen professional contests, and as such, Gaethje was a hot prospect when signing with the world MMA leader. We know the story. A fighter comes from nothing, trains, fights, wins, gets to the UFC, wins – maybe a few setbacks – becomes champion. That’s how it goes, so such a transparent subversion of the narrative is uncomfortable to an MMA fan. Everybody wants to win, and if we can’t win, we want the guy we’re backing to win. It’s human nature; primordial – victory at all costs. What do we do when a third option is presented? What do we do when the person we’re backing makes it his business to take physical damage? “I go in there to entertain people.” It’s difficult to imagine a person taking up such a physically diminishing line of work for the mere amusement of people they don’t even know. To be fair to Justin, his sincerity on the matter has never waned, but we can’t help but look for structural weakness’ in such a stance. Could it be an excuse? Possibly, but to disregard it as such sacrifices a compelling and potentially important topic for posterity. Fighting is entertaining, but is it entertainment? It may seem foolish to separate the two ideas, but when a sport centres around the physical harm of the loser at the hands of the winner, there will naturally be hesitation to write it of as a simple distraction. Seeing it through the lens of competitive performance may dull the itching of the fabled “fighting fans guilt” that, whether we like to admit it or not, loiters at the back of our minds. Some simply like the violence though. Some want to see people get bloodied, broken and finished. It’s in us all to a certain extent – I mean, if we didn’t enjoy violence, we wouldn’t be watching MMA. But, reconciling the hedonism of such a pastime and a desire to see fighters take care of themselves whilst finding ways to win is something we all deal with on different levels. Personally, I enjoy the chaotic brawls as much as the next man. They’re exciting, invigorating. When an entire arena is on its feet applauding two blood-soaked warriors as they embrace, we think to ourselves “this is why we watch”. How far do we really want it to go though? How much can the excitement of a barn burner blot out the big CTE cloud that looms up above? This is all distilled in the current circumstances surrounding Justin Gaethje. The Safford, Arizona native finds himself standing as a monument to the moral dissonance of the modern fighting fan. When does it stop being entertaining? How many times can we watch a person get punched in the head until it isn’t fun anymore? Maybe Gaethje has the answer. Maybe cutting his career short allows him to do what he says he loves, to entertain people. Perhaps that makes it okay, or perhaps it doesn’t? This is something that must be left with you. What is okay? What isn’t? I don’t have the answer. Who does?